In the spring of 1923, a white frame structure replaced the portable tabernacle, and in 1924 the sides of the building were expanded. Construction on a brick building began in 1930, and services were held at nearby Sacramento Plating until the completion of the new building in 1931. In 1949, the building was expanded with the addition of the Gardener Annex, a new main sanctuary. Finally, in 1967, ground was broken for the beautiful new sanctuary which we enjoy today. It was completed in 1969, and a sign proclaimed the New Sanctuary – First Church of the Nazarene. The unusual curved beams in the sanctuary have a special symbolism. They curve out and upward from the cross above the platform, and were designed to represent God’s care, concern and compassion towards all. Senior Pastor Marcia Hull joined the staff in January 2013. She lives with her husband, John, in Elk Grove. Pastor Marcia is passionate about people and wants to share the hope that only Jesus Christ can give…..unconditional love and forgiveness. 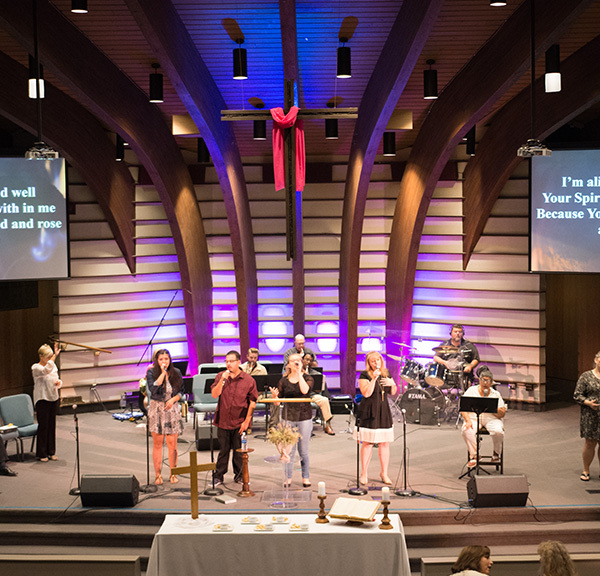 We at First Church are a Bible-Believing and Christ-Loving group of people, compassionate to the needs of the community, centered on forgiveness of sins through the blood of Jesus Christ and the infilling of the Holy Spirit. Through his work in us, we realize we need God and each other to grow in our everyday walk towards Christlikeness. We strive for surrendered hearts and a deep love and commitment to God and others. Our goal is to love God with our whole being, love others, and help each other do the same.